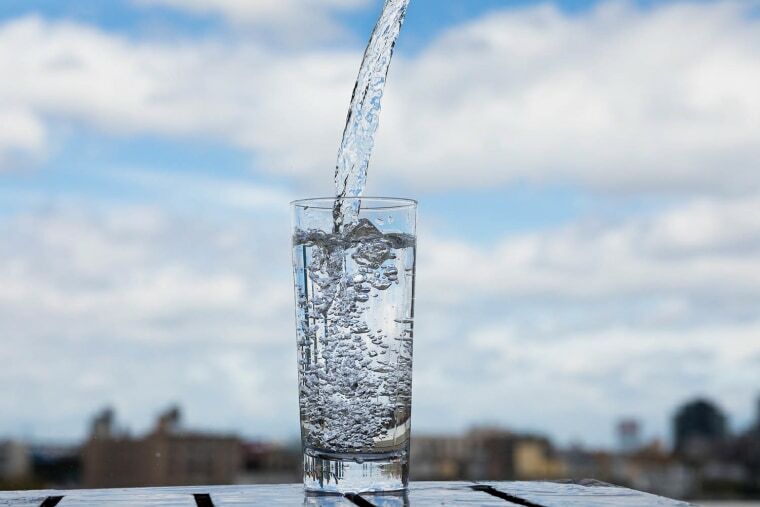 As much as we glorify the beverage (rightly so) many of us aren’t getting enough: More than half of children and teenagers in the United States are not properly hydrated, according to a nationwide study from the Harvard T. H. Chan School of Public Health. The problem doesn’t stop when we enter adulthood: The Natural Hydration Council found that one in 10 consultations for tiredness and fatigue could be attributed to dehydration, and more than a third of the patients reported feeling better after drinking more water. The problem is, among the 300 general practitioners surveyed, just 4 percent believed their patients were aware of how to hydrate properly. It may seem like a no-brainer — just drink more water. But do you know exactly how much you should be drinking? How Much Water Do You Need to Drink, Anyway? We all know the eight-glasses-a-day rule, but is it something we should hang our hat on? While the goal certainly isn’t a bad one to aim for, the actual equation is more complicated. “It is somewhat arbitrary as it doesn't take into account the size, activity, environment or diet of the individual,” says Dr. Barry Sears, leading authority on the dietary control of hormonal response and author of The Zone Diet. So where did this guideline come from? Dozens of factors can affect a person’s individual water needs, from exercising to sickness to the temperature outside. That being said, there are dozens of factors that can affect each person’s individual water needs, from exercising to sickness. While you may not be able to determine an exact number of glasses that will ensure you remain perfectly hydrated at all times, there are some key steps you can take to keep you out of the dehydrated zone. Essentially, thirst is a symptom of dehydration. "Our thirst sensation doesn't really appear until we are 1 or 2 percent dehydrated. By then dehydration is already setting in and starting to impact how our mind and body perform." One thing most of us fail to recognize is that our water intake isn’t only coming in a glass — the foods we eat make up a large chunk of our intake. “What wasn’t adapted was the part of the recommendation that suggested that most of this 2.5 liters would come from foods,” says Kleiner. Energy: “Staying hydrated helps maintain our energy levels by keeping muscles energized. Plus, dehydration can manifest as fatigue or low energy, so staying hydrated will help prevent that,” says Kleiner. Even mild dehydration can affect your mood, energy level and ability to think clearly. Even being mildly dehydrated can have effects on your mood, energy level and ability to think clearly, according to studies conducted at the University of Connecticut’s Human Performance Laboratory. So the next time that mid-afternoon slump hits, consider trading the trip to the vending machine for one to the water cooler. Sleep: “There is little research on how dehydration may impact sleep, but if you’re experiencing muscle cramping, headaches or dizziness due to dehydration, chances are that you likely won’t be getting good quality of sleep,” says Kleiner. Plus, a study published in the British Journal of Nutrition found that male subjects experienced fatigue, tension and anxiety when mildly dehydrated. As we know, stress (and its symptoms) can affect our sleep quantity and quality. Productivity: “The neurons in the brain require adequate hydration to maintain optimization transmission of neurotransmitters,” says Sears. Even mild dehydration can result in disorientation, dizziness and fuzzy thinking, added Kleiner. A study published in The Journal of Nutrition found thatmild dehydration caused headaches, fatigue and difficulty concentrating. The female subjects also perceived tasks as more difficult when slightly dehydrated. So consider swapping that pre-meeting coffee for a glass of ice water to be the most alert. Convinced it’s time to start upping your intake? We thought so. Here are some super simple strategies for sipping more water throughout the day. Every time you go to a new place, drink. A meeting, the gym, a bar? Time for a glass of water. When our BETTER team challenged themselves to increase their water intake they found this tactic particularly helpful. It’s easy to sip when you’re sitting at your desk. But when you’re running errands on the weekend, heading to the gym or meeting friends for happy hour it gets a little harder to remember to sip. Setting the simple goal of drinking every time you change locations is an easy way to remember. Set an alarm reminding you to drink water. Another takeaway our team found helpful in their quest to hydration? Setting alarms to remind themselves to drink. If you’re not good at staying on top of setting the alarm, invest in a water bottle that does the work for you. Most of them have the added benefit of also tracking your water consumption, which one of our editors found helpful: “Being able to track how much water I'm drinking and assess how I'm feeling based on that has helped me realize that my body needs more water than I expected and that my afternoon headaches aren't from stress or a coffee (or three) too many, but were actually from being dehydrated,” Emily says. Pair food with water. “Make sure to have a beverage with every meal and snack, so at least you know you’ll be getting fluids several times throughout the day,” says Kleiner. Make your water fun! “Add berries, citrus fruits, apples and cinnamon, cucumbers and mint to your water bottle to add flavor without adding calories,” says Kleiner.